It is virtually certain that the unemployment rate will rise in coming months. The economy added just 115,000 jobs in April. While the March number was revised up to 154,000, the 135,000 two-month average is well below the 252,000 average for the prior three months. Clearly much of this story is bounce back, where the unusually good winter weather brought much hiring forward. In spite of the slower job growth, the unemployment rate edged down again to 8.1 percent. However, this is not a case of the household survey showing a different picture than the establishment survey. As was the case last month, the drop in unemployment was entirely attributable to people leaving the labor force. The employment-to-population ratio (EPOP) fell by 0.1 percentage points for the second consecutive month, to 58.4 percent. This is just 0.3 percentage points above the low for the downturn. There are few sectors in the establishment survey that have shown much strength over the last two months. In the clearest case of a weather effect, construction employment has edged down by 6,000 since January after increasing 44,000 from November to January. The general trend may be upward here, but very slowly. It is worth noting that unemployment among workers in the construction industry fell to 14.5 percent in April, implying they added just 0.2 percentage points to overall unemployment. Manufacturing added 16,000 jobs in April, almost all in durable goods. Over the last five months, job growth in the sector has averaged 35,000 per month. The health care sector added 19,000 jobs in April, slightly less than its 27,000 average over the last year. The restaurant sector added 19,700 jobs, slightly higher than the 15,000 average over the last year. The employment services sector added 21,100 jobs in April, but much of this was reversing a loss of 9,400 jobs in March. There was a similar story in retail, which added 29,300 jobs in April after losing 20,900 (both mostly in department stores) in March. Both sectors are showing erratic movements, but not much growth. The government sector lost 15,000 jobs in April, slightly less than the 18,000 average loss over the last year. (The March gain was revised to show a loss of 12,000 jobs.) Local education accounted for 10,700 of the lost jobs. There was an anomalous decline of 11,000 jobs in passenger and ground transportation. This will likely be reversed. It's worth noting that 93.1 percent of the private sector jobs created over the last year were classified as production non-supervisory jobs. This compares to 82.4 percent of jobs falling in this category last year. These are generally thought to be less-skilled positions. This implies that job growth is most rapid at the middle and bottom of the labor force right now, rather than at the top, as many have claimed. There is not much positive in the household survey. The survey shows a drop in employment of 200,000 since February. This is almost certainly just an erratic movement in the data, but the pattern in EPOPs is more consistent with the job growth numbers in the establishment survey than the sharp drop in the unemployment rate. The economy needs 100,000 jobs a month to keep pace with labor force growth; the 1.8 million jobs created last year would not be expected to lead to a fall of 0.9 percentage points in the unemployment rate. By demographic group, the worst story is among black men and black teens. The former has an EPOP that is 6.5 percentage points below its pre-recession level. Black teens have an EPOP of 15.5 percent, down 9.0 percentage points from the 2006 level. The EPOP for black women is down 3.7 percentage points from its pre-recession level, but has risen 3.2 percentage points from lows hit last summer. The EPOP for white men is 4.8 percentage points below the pre-recession level, but up 0.6 percentage points from last summer's low. 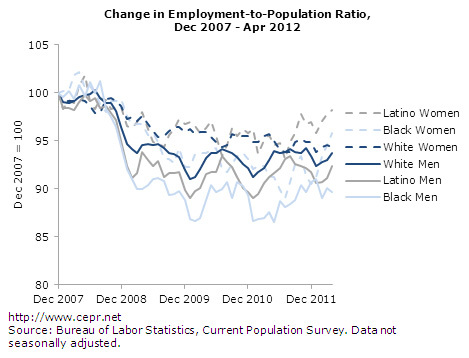 The EPOP for white women is 3.0 percentage points below its pre-recession level, but hit a new low in April. It is important not to place too gloomy a picture on the April data. The weakness in March and April is the flip side of the stronger growth the prior three months. Nonetheless, the economy is not growing fast enough to bring unemployment down quickly.